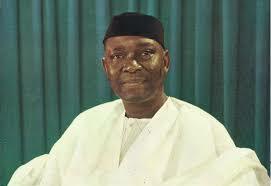 Nnamdi Azikiwe popularly called "Zik", was a statesman and the first President of Nigeria. He was Governor General of Nigeria from 1960 to 1963 and the President of Nigeria from 1963 to 1966 (when Nigeria became a republic). Considered a driving force behind the nation's independence, he came to be known as the "father of Nigerian Nationalism". Zik was born in Zungeru in present-day Niger State. Azikiwe later stayed with his aunt and grandmother in Onitsha (his parental homeland, and had his secondary education in Lagos. This exposed him to the different Nigerian cultures and he spoke the three main languages which was an asset to him as a nationalist. Azikiwe traveled to the United States and attended Storer College, Columbia University, the University of Pennsylvania and Howard University before returning to Africa in 1934, where he began work as a journalist in the Ghana (then Gold coast). Zik advocated for Nigerian and African nationalism as a journalist and a political leader.